ชุดทดสอบความกระด้างของน้ำ (Total hardness) HI38033 ใช้หน่วย Grains per gallon (GPG) ซึ่งกำหนดโดย EDTA (Ethylene-diamine-tetraacetic acid) titration. 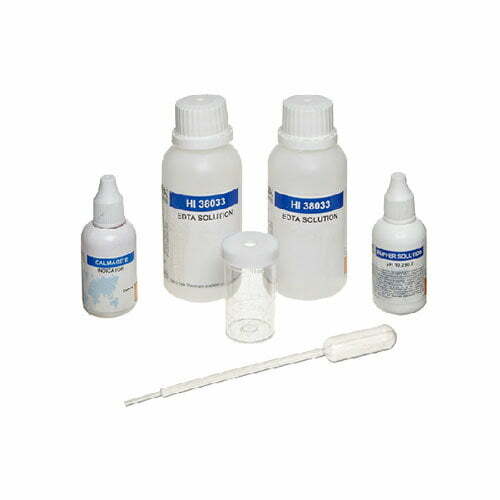 All required materials are included with the test kit, such as the sample beaker, plastic pipette, and reagent bottles. Readings from 0 to 30 gpg are determined to 1 gpg resolution. There is no need to buy a new kit when reagents are exhausted. 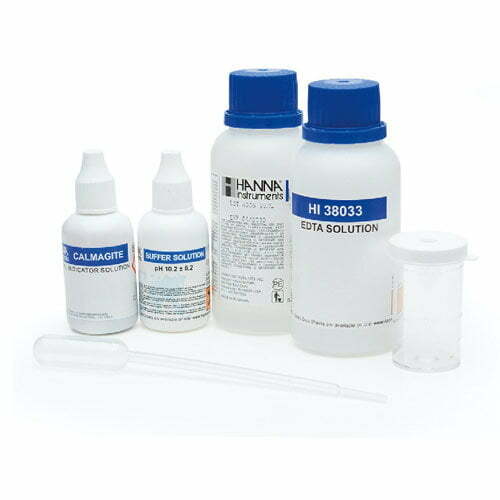 The HI38033-100 reagent set can be ordered to replace the reagents supplied with the kit. This reagent set comes with 1 (30 mL) dropper bottle of buffer solution, 1 (10 mL) dropper bottle of Calmagite indicator, and 2 (75 mL) bottles of HI38033-0 EDTA solution. Ordering Information: HI38033 test kit comes with 30 mL buffer solution, 10 mL calmagite indicator, 75 mL EDTA solution (2), 20 mL plastic beaker with cap, and 1 mL plastic pipette.